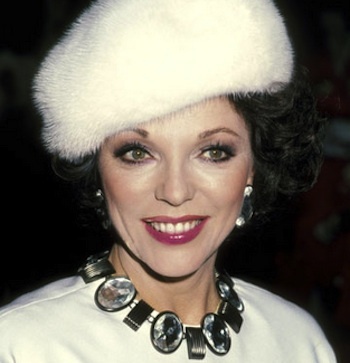 Wigmaster, Too Damn Famous author and Dynasty star Joan Collins was constantly dodging cocaine attacks from 1950 to 1960. In the Rat Pack days, Collins huffed and puffed and blew Sammy Davis Jr.’s stash away. “Sammy Davis Jr. tried to give me cocaine on a spoon. I said ‘No Sammy!’ and blew the whole spoon all over his blue velvet dinner jacket,” the notoriously anti-drug screen queen told The Sun. April 18, 2013 April 17, 2013 cocaine, coke, Joan Collins, Rat Pack, Sammy Davis Jr.